CORE Cabling is part of the CommScope PartnerPRO Network, Certified by CommScope to supply, install and warranty Systimax and Uniprise network cabling solutions. Plan now to support increased bandwidth! With the penetration of Internet of Things (IoT) devices predicted to be 20-50 billion strong by 2020—and internal data centre traffic expected to grow threefold over the next five years—enterprise data centre bandwidth is at risk of being overloaded in the near future. In order to meet and prevent the challenges associated with escalating data rates and overloads, CommScope has developed LazrSPEED OM5 WideBand Multimode Fiber (WBMMF) cabling solutions. These solutions enhance the ability of short-wavelength division multiplexing technology to provide an increase in useable bandwidth. Total bandwidth is the result of combining modal bandwidth and chromatic bandwidth. 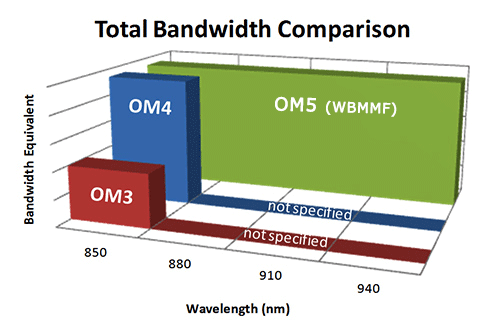 OM4 delivers higher bandwidth than OM3 at 850 nm. LazrSPEED OM5 WideBand extends the capability of OM4 across enough spectrum to support at least four low-cost multiplexed wavelengths. For more information on CommScope products, design, or installation, please contact Core Cabling today!